Click on the ‘DONATE OPTIONS’ button below to donate to PEACE Lutheran Church and to choose from the charitable organizations and funds PEACE supports. Choose from the drop-down menu, and give using your credit card or bank account. You can even set up recurring donations. DONATING ONLINE IS SECURE AND SAFE! Please watch the Tithely video for general information about donating online. Donations on this site use the Tithely payment service, a platform built especially for churches. Your information is completely secure! PRESERVE THE FULL VALUE of your donation! TITHELY, our secure, online donation platform, charges PEACE a transaction fee.For credit cards, that charge equals 2.4% of your donation plus a 25¢ per transaction fee. For donations from your bank account, Tithely charges PEACE 0.5% of your donation, plus 25¢. Then, they send PEACE the rest. To preserve your donation’s full value: Click the GIVE button. When the Tithely window comes up, SCROLL DOWN to the box that reads, “Cover fees” and CLICK on the circle; the circle will turn green. The Tithely charge will be calculated automatically and ADDED TO YOUR DONATION. So, for example, a $100 donation, with the Tithely fee covered, comes to $102.65. Or, send a check. If you prefer, please send a check for the amount of your donation. Made your check payable to PEACE Lutheran Church, and write the name of the fund in the memo line. Mail your check to PEACE at 828 W. Main St., Grass Valley, CA 95945. Our volunteers will make sure 100% of your donation gets to its destination! The Tithely drop-down menu lets you choose from the many special funds at PEACE Lutheran Church. These including giving for flowers, for special holy days, for our PEACE Choir and other ministries of PEACE. Options also include local and national charities that PEACE supports actively, including Interfaith Food Ministry, Hospitality House and ELCA Disaster Relief. REGULAR GIVING – For any fund you choose, you can make a one-time gift or set up regular contributions (recurring donations). These funds, plus others, appear on the Tithely drop-down menu. MISSION ENDOWMENT FUND – Your gift to this endowed fund supports God’s work in our community, our country and around the world. RWANDA FUND – PEACE Lutheran Church has a 20-year connection to the central African nation of Rwanda. Our Rwanda Connection Committee raises money to support various programs there, including Rwamagana Lutheran School and the Rev. John Rutsindintwarane. ORGAN CAMPAIGN – All donations go directly toward the purchase of a new organ. 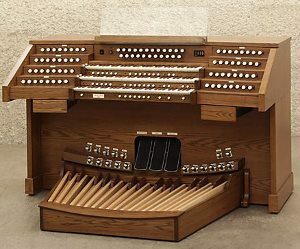 In 2016, PEACE embarked on a long-range plan to raise money for a new organ for our Sanctuary. PEACE LUTHERAN CHURCH GENERAL FUND – This fund makes faithful stewardship easy! Use this fund to make a general donation to PEACE Lutheran Church. THIS FUND SUPPORTS BASIC OPERATIONS, such as Sunday morning worship, Bible study, Sunday School, Eucharistic Ministry, maintaining our musical instruments and other ways we minister to each other and to our community. You can choose your fund from the drop-down menu and give using either your credit card or bank account. You can also set up recurring donations. When you donate through PEACE Lutheran Church, your financial gifts help people whose lives have seen the devastation of natural disaster, the trauma of homelessness, the privation of hunger and the uncertainty of health crises. Your generosity reaches families locally, across the United States and around the world. By giving to the funds here, you can be sure that your donation benefits the people who need it. At PEACE, we believe that all we have comes from God. God has showered the earth with blessings, and charges us with being good stewards of that abundance. We give joyfully to our church home so we can be a light in our community! Through our giving, we can show God’s love to others!